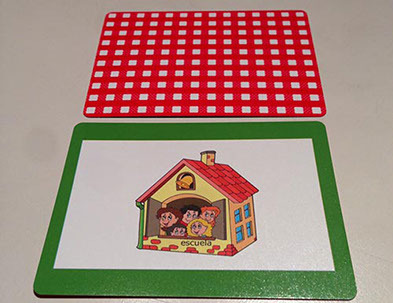 Custom Playing Cards in Poker Size are the most common size of playing card that we make. 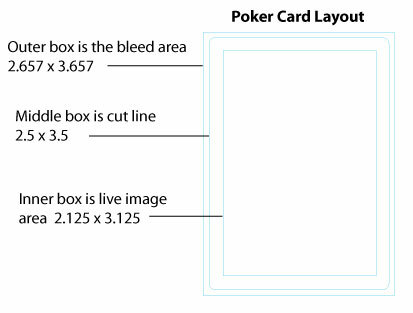 Poker size playing cards measure 2.5 x 3.5 inches in size with a 2.125 x 3.125 live area as shown in the template below. The bleed size of a poker deck should be 2.657 x 3.657 to allow 1/8 th of an inch bleed all around the edges of the playing cards. Poker decks measure about 3/4 of an inch in thickness - the cards themselves are generally 300 gsm or the equivalent of 12 mils thick when measured with a micrometer.